The Mac App Store is still in its infancy when compared to its older brother, the iOS App Store. Opened officially in January 2011, it celebrated its first birthday last month and has been an extremely successful outlet for Apple in those twelve months. The Mac App Store offers digital downloads of software in similar fashion to the iOS application outlet but contains software designed and developed for machines running Mac OS X 10.6.6 and later. One of the great things about the store is the total convenience that it provides to consumer, with software titles broken down and users being able to sift through them using the search function or by filtering applications out by category, popularity or price. As with the iOS App Store, MAS contains some outstanding software releases and also some not so good pieces of kit which should be avoided, but it also offers a large selection of free and commercial software. Once such free application falls under the ‘Reference’ category, developed by Ian Page and is known as ‘Mactracker’. Mactracker offers a nostalgic trip down Apple memory lane by providing in depth details on every Apple computer ever made with full technical specifications including things like processor speed, memory details, graphics card, optical drives, supported OS versions, expansion options and much much more. The application seems to truly cover all bases and dates all the way back to the Macintosh 128K which was launched in January 1984. Considering the company has such a long list of computer releases in its history, you’d be forgiven for think that Mactracker provides enough information just by curating that list. However, the application goes above and beyond that by profiling desktops, notebooks, servers, mobile devices and peripherals as well as iOS and Mac OS X software releases. The information contained within Mactracker is truly mind blowing when you consider that each entry, whether it be a MacBook or a PowerBook G3 contains another four or five screens of information which relates to its support status, launch price and availability as well as a textual history of the product and any relevant links or notes which users might find useful. Mactracker is laid out in a very simple, but effective manner which allows efficient navigation of the application with all information, text and images being formatted in a clear and readable way. It even has the option to add your own devices in and assign warranty expiration dates so you can keep track of that kind of thing, as well as a feature which reads the specification of the Mac that you are using and provides you with information about your own machine. What makes Mactracker even better is that not only is it free of charge, not only does it get regular updates as new products are released and updated but it also has a free of charge iOS application to accompany it should you require any of this encyclopedic information while on your travels. The iPhone version contains all of the same level of information but formatted perfectly for use on the smaller mobile device. When paired together, the Mac and iOS versions make a very powerful toolset for Apple historical product information. 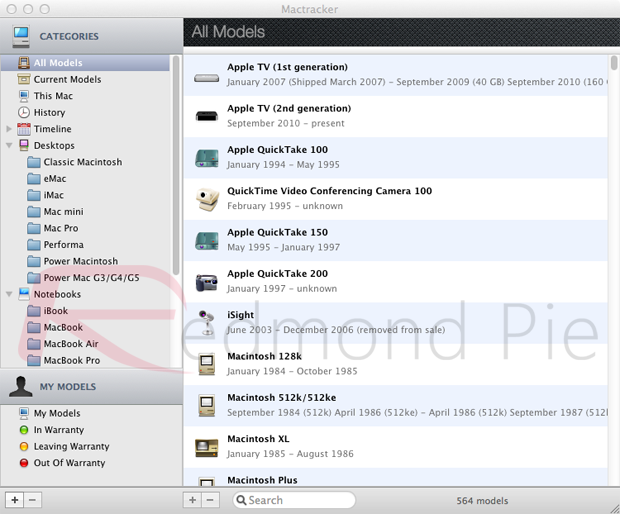 Download Mactracker for Mac [Mac App Store Link]. 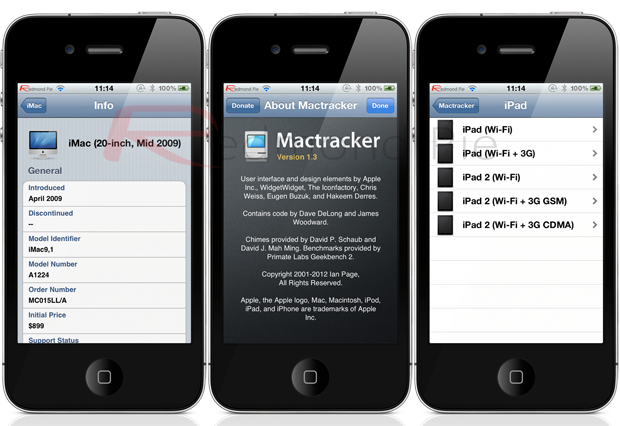 Download Mactracker for iPhone [iTunes Link].